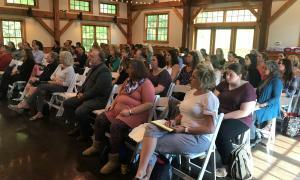 Nearly 70 home visitors and other professionals who work with children attended a half-day training event last week hosted by the Monadnock Home Visiting Alliance. Presenter Cassie Yackley, Psy.D., PLLC spoke about the role of home visiting professionals in promoting healing and resilience in traumatized young children and their caregivers. "It's hard to watch kids struggle," Yackley said. But there is no "magical tool" that can heal trauma, she said. Rather, Yackley spoke to the group about using trauma-responsive frameworks that provide appropriate expectations and helping caregivers understand what children are going through. Yackley and the group worked together to identify and name factors that defined a traumatic incident. Yackley also gave the group the opportunity to discuss challenging behaviors they have experienced in the children and families they have worked with, and explore trauma-informed responses to those behaviors. Yackley said trauma can seem so widespread nowadays that people, including professionals working with traumatized children, can become desensitized to it. But she reminded everyone in the room of the importance of their work. "We do work that has an impact," she said. Click here to learn more about Yackley. The training was provided for free by the Monadnock Home Visiting Alliance. The alliance is a pilot collaborative backed by Monadnock United Way’s signature early childhood initiative, Impact Monadnock. It is composed of Home Healthcare Hospice & Community Services (HCS) Healthy Starts, The Grapevine Family and Community Resource Center, Rise for baby and family and The River Center Family and Community Resource Center. For more information about the alliance, click here. We win by LIVING UNITED. By forging unlikely partnerships. By finding new solutions to old problems. By mobilizing the best resources. And inspiring individuals to join the fight against our community’s most daunting social crises. Every day, Monadnock United Way works alongside our dedicated partners throughout the area to serve those in need and find ways to advance our giving across nearly 40 communities in the Monadnock region. © 2019 Monadnock United Way .